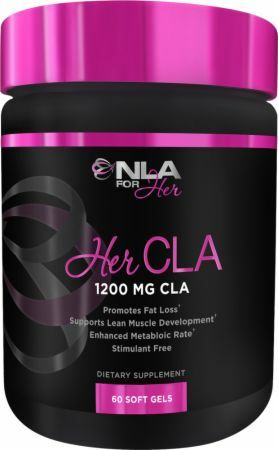 Her CLA by NLA for Her at Bodybuilding.com - Best Prices on Her CLA! HER CLA is our potent, highly concentrated form of the naturally occurring Conjugated Linoleic Acid (CLA). When combined with regular exercise HER CLA can help you achieve a lean body. HER CLA assists in lean muscle development which in turn supports natural fat-burning as the body burns calories to sustain proper muscle function. HER CLA supports higher metabolic activity in your body which can lead to an overall reduction in body fat as your body burns extra calories! We take pride in quality here at NLA For Her and guarantee that each batch of Her CLA is manufactured under strict quality control standards. Each batch is tested to be free of potentially harmful levels of any contaminants (metals, PCB's, dioxins, mercury, heavy metals, and other harmful contaminants). Stack HER CLA with SHRED HER and HER GARCINIA for maximum fat burning. What type of supplement is Her CLA and what are its benefits? Her CLA is Conjugated Linoleic Acid which is a powerful and very important essential fatty acid (EFA) - meaning our bodies need it but do not produce it on our own, it must come from diet (dairy and animals fats) and/or supplementation. CLA can help your body reduce body fat by helping to increase its metabolic rate and supporting your immune system, altering your body’s fat-to-muscle ratio when used in conjunction with a consistent workout regimen. How can Her CLA help you achieve your fitness goals? Her CLA can increase your metabolic rate when taken consistently as part of a healthy diet and workout regimen. It reduces your body fat by converting the food you eat more efficiently into energy, which helps oxidize your fat and keeps fat cells from getting bigger. I suggest taking one capsule, three times daily with meals everyday! My favorite CLA product. Just love it! The label I have is different: On the front it reads "1200 MG CLA" but the supplement facts shows the product has 1200mg of Non-GMO Safflower Oil and 960mg of Conjugated Linoleic Acid. My product's label shows details about CLA but not the safflower oil that is listed, which is odd. I reached out to customer service and they are supposed to be shipping me the product that is pictured. I will contact NLA For Her as well, because I was told Bodybuilding.com gets the product from them. I thought NLA For Her was a reputable brand smh. Read your labels, folks! My go to CLA supplement for years now. Since my weight loss journey started two years ago I have lost over 40 lbs while gaining lean muscle. I bought the stack of Shred Her, Her CLA, Her Garcinia, and Her Carnitine. I am beyond impressed. I lost 8 lbs in the month taking these products. Purchased the fat burner stack..amazing results. I am excited to re-purchase to use while I am training for that summer Cali body!! I have absolutely noticed fat loss in my tummy which is a huge problem area for me given my height, torso length and where I tend to carry fat. Love this product. Purchased the Live Lean Stack with Shred Her and Her Garcinia. Wow! I am seeing great results and am down 5 lbs! Very effective and consistent. This is a high quality CLA product with an effective dose per serving. Very effective! With proper diet and drinking a lot of water/working out daily, I lost 5 lbs in a week. You will definitely lose weight with this product. Will be buying again! This is a great product for my body. When I do not use the product I notice a difference versus when I do take it. There is nothing that makes this a CLA "For her". It's just CLA. Her CLA is my go to CLA. It is way better than the rest because it is an amazing price and has 1200 mg of CLA per serving. Love stacking this product with Shred Her for fat loss. I LOVE this. I have been working out for a while and felt my results weren't where they needed to be. I started taking CLA from her brand and now my metabolic rate seems to be burning more as if I was in high school again. This is defiantly what I was looking for. I take this 3 times a day. Breakfast, lunch and dinner. Out of everything this is my favorite. I have ordered this product twice. The second time I purchased it with Her Garcinia and Shred Her. These products work well together to help you lose fat and see muscle. Great product! Safflower Oil, Gelatin, Glycerin, Water. Directions For Her CLA: As a dietary supplement for women, take 1 soft gel three times daily. Warnings: Do not use if pregnant, contemplating pregnancy, or nursing. This product is only intended to be consumed by healthy adults, 18 years of age or older. Before using this product, consult with your physician. Discontinue use and consult a health care professional if you experience any adverse reaction to this product. Store in a cool, dry place below 80°F. KEEP OUT OF THE REACH OF CHILDREN.